Today city council is going to consider giving a $250,000 contract to yet another out of town company. The contract would require the company to recommend a site for the proposed arena. There are evidently economic advantages to us if the new arena is located within 1,000 feet of the current convention center. The convention center is a pretty good sized piece of property. The graphic below shows an area with a radius of 1,000 feet from the red arrow. The arrow could be moved along the perimeter of the convention center if they need to move the circle. This entry was posted on Tuesday, February 7th, 2017 at 5:00 AM and is filed under City government. You can follow any responses to this entry through the RSS 2.0 feed. You can leave a response, or trackback from your own site. Mayor Leeser said no more wasting taxpayer money and said up front he would immediately veto a new study if approved so it was scraped. 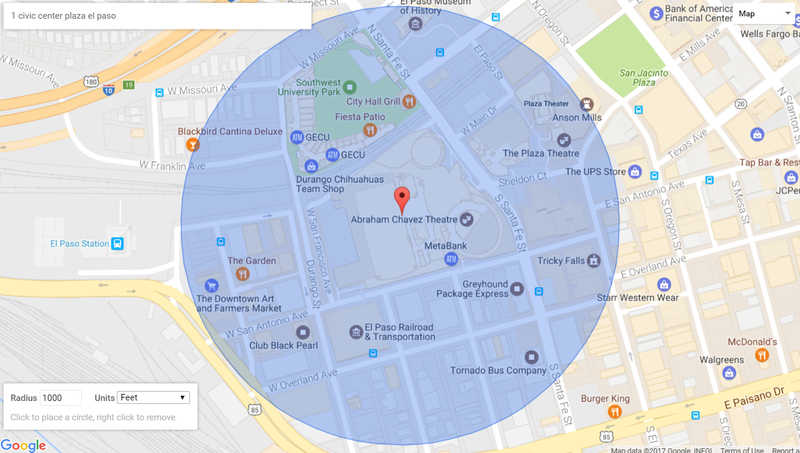 You can move that circle one or two blocks in any direction if you measure from the perimeter of the convention center to the edge. We’re going to get an arena because the “people” voted for it. And it is going to be downtown because the “people” voted for it. Rather than complaining about which individual builder / developer / land owner will benefit, those who oppose an arena could better spend their time lobbying their city rep to have a city wide re-vote on it. Let’s put it to a vote. I think El Paso is ready to give up on the arena. It’s one of those ideas that sounded good at the time. But there is no ‘big developer” conspiracy here. Oppose it because we can’t afford it. That’s the real reason we should not build it. How many days of the year would an arena be used ? Would it pay for itself ? Would it make a profit ? The Sun Bowl takes care of any “Arena” events that come thru here. A NEW Arena would divert funds from UTEP so UTEP many need higher tuition’s and other fees to offset the loss. How does UTEP feel about this ? Is the UTEP Sun Bowl not available for certain events ? Has the President of UTEP been invited to give her take of the consequences of “ANOTHER Arena, to City Council ? No, you couldn’t do this study even for less money because if you’re in El Paso, you must be unqualified. If you’re still here, they’re not interested in what you have to say. Why not an underground arena, if it is really necessary that El Paso have an arena? ? No historical buildings or slums are torn down, very few people might have to move. So it costs a few billion more dollars. The taxpayers of El Paso will be over-joyed to pay for it. I think the best thing I will come across all day is that “circles are not complicated.” A good lawyer would require a lot of money to argue against that. The successful contractor will give the people that approve the payment of the contract the results they already want. The successful contractor will focus on the desires of big money and not the City’s historical but underutilized treasures. Do we really need Foster’s soccer arena so near to his other holdings? No wonder we have an idiotic megalomaniac in the highest office of the land! We are all just a stupid as we can be!